On the south rim of the Grand Canyon. I read somewhere that Red Fox was The North Face of Russia. It's so popular that even Vladimir Putin wears it. I don't know if that is true, and frankly it doesn't really matter. Brand popularity doesn't interest me, good gear interests me, and the Red Fox Odyssey 80 backpack is definitely good gear. The first thing I did when it arrived was fit the pack. With a fully adjustable torso I had it dialed in pretty quick. I loaded it with 30 pounds and paced around the house. It felt too good to be true. I had to see more. An hour later I was on top of a mountain. The pack had preformed beyond my expectations and had comfortably hauled my haphazardly packed load with ease. A few days later I was standing on the south rim of the Grand Canyon. The Odyssey 80 was brimming with backpacking gear, 5 days of food, and nearly 2 gallons of water. Even with a successful test-run, I wasn't looking forward to carrying that weight over the next 34 miles. If there ever were an ultimate proving ground for gear, it’s the Grand Canyon. The place is extreme, and in all my adventures over the years I've never encountered anything like it. The rocky terrain, unrelenting sun and insurmountable giant-cliffs everywhere will test the mettle of any backpacker, especially if you veer far from the popular corridor trails like we did. Needless to say, the Odyssey 80 took a beating: It broke my fall after I slipped on loose rocks, and was repeatedly dropped and manhandled. It was forcibly squeezed through narrow openings in-and-between rocks, and was lowered by rope down a twenty-foot cliff… All that, all the time. The rocks tore holes in other packs from my group, but the Odyssey 80 still looks brand new. That’s what I love about it. It’s a beast! Lowering the Odyssey 80 down a cliff. This beast isn't just durable, it’s huge… and hungry. With a massive 80 liter volume the Odyssey will swallow just about anything you stick down its gaping maw, and with multiple pockets and compartments, organization is easy. A variety of lashing points on the outside gave me options for securing my trekking poles when I needed my hands, and the zippered side pockets were long enough to fully secure Smartwater bottles with an attached Sawyer Mini. The storage options are many, but with all that stuff comes weight. The Odyssey’s aluminum frame carried the near 40 pound-load admirably, while the heavily-padded hip-belt was a welcome change from the ultralight backpack I normally use. All these amenities make for a very technical trekking load-hauler, but all the floppy straps dangling from my pack was annoying. Regrettably, the backpack doesn't have any lashing options on the lid where I really needed them for fixing my solar panels to keep the GoPro charged. Adjustable torso is easy, but slips. The only real problem I had with the Odyssey was that the adjustable torso, which is essentially a strap, slowly slipped throughout the day. Whereas I would set my torso length at “medium” in the morning, by late afternoon it had slipped a quarter of the way to “small”. It wasn't a huge slip, but it was certainly enough to feel it in my shoulders. Eventually I got in the habit of checking the torso length every time I took the pack off. Despite a couple hiccups the Odyssey 80 is a nice backpack capable of hauling heavy loads over rough terrain. It’s large enough to accommodate any gear requirements with a variety of storage options, and will stand-up to even the worst abuse. Anyone looking to take their adventuring to the extreme should definitely give it a look. Packs on the trip from Osprey, Deuter, REI, and Red Fox. For the entire catalog, check out the Russian language page. I believe most of this gear will eventually be available through Red Fox North America. Disclosure: I was given the Red Fox Odyssey 80 by Red Fox at no cost of my own for the purpose of a product review. The opinions expressed in the review about the product are my own. Recently I lent this pack to a friend to use. He pointed out that he could not adjust the torso length past medium, and that one of the aluminum stays was tearing from the backpack. At first I thought he must be mistaken, but after he returned the pack I inspected and confirmed his observations. As you can see from this photo, one stay has ripped through the fabric, and the other appears well on its way. I don't know whether this is a design flaw or simply a defect. I did not spot this problem earlier because I never attempted to adjust the pack past medium, and the stays cannot be reached without removing the back panel. Although it is entirely possible that the slipping torso length that I experienced in the Grand Canyon was a result of this. Consequently. 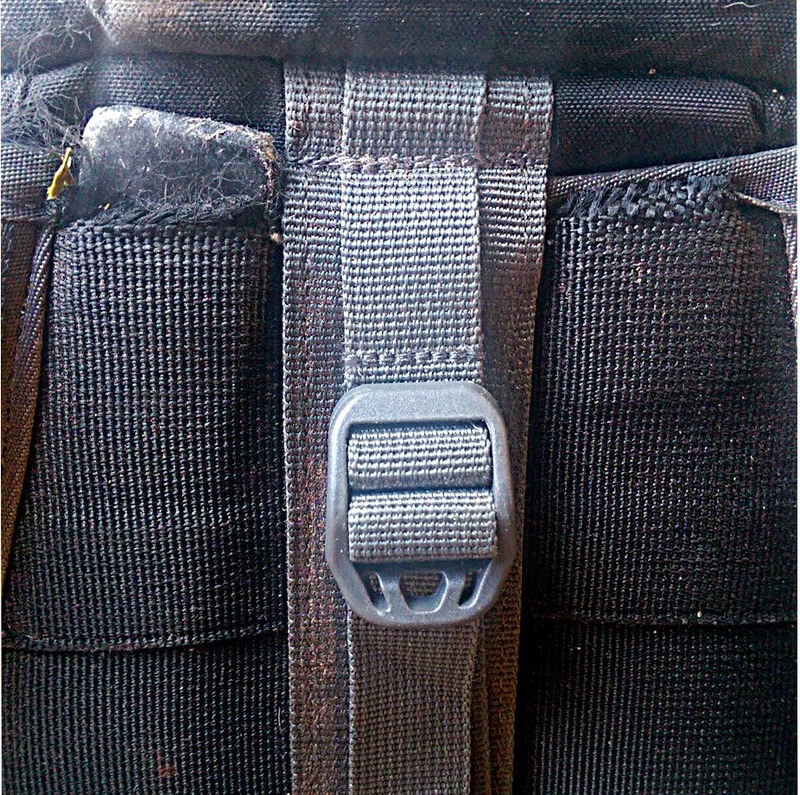 I cannot recommend this backpack due to the failure of the suspension and torso adjustment systems so soon.